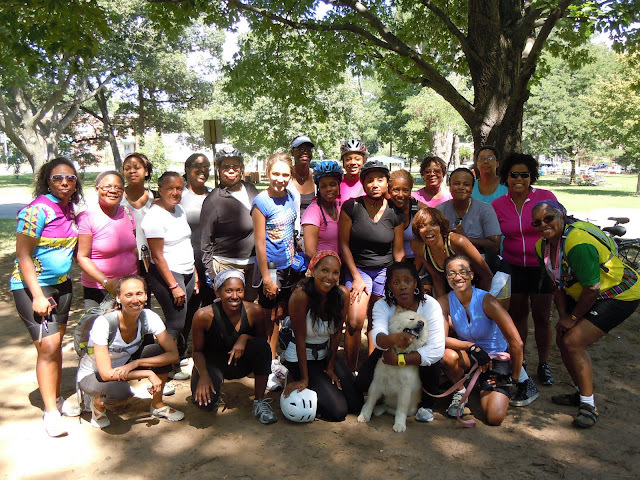 On Saturday July 16th, the lovely ladies of Ward 7 hosted a Black Women Bike DC ride and lunch. Twenty-six women came out for the ride. There were 10 Ward 7 residents of which 4 of us were from Hillcrest. The age range of the participants was late 20's to mid 60's. Experience levels ranged from "I got my bike yesterday" to "I've done triathlons". Our ride started at Eastern Market metro station plaza. Randall Meyers from WABA checked tires and brakes before we headed out. Our 7-mile took us through Potomac Gardens, around the Anacostia River, and stop at YES! Organic Market for lunch. Our final destination was Fort Dupont Park were we ate and talked.